From January 1792 fashion magazines had advised women to stop wearing conspicuous colours – even red, white and blue, however patriotic, drew too much attention to the wearer. By the winter, fashion magazine themselves were no longer being published. Women of all classes went hatless when they ventured on to the streets, wearing wooden clogs on their feet and shawls over their chemises: heavy rouge was their only concession to style. Lucy de la Tour du Pin’s former maid, in her spotless white apron, was drawn aside one day on the street by a cook who told her she would be arrested as an aristocrat for going out in such unpatriotically clean clothes; she was advised to wear coarse cloth instead. Aggressive beggars wore huge tricolour cockades. Men went unwashed and unshaven. 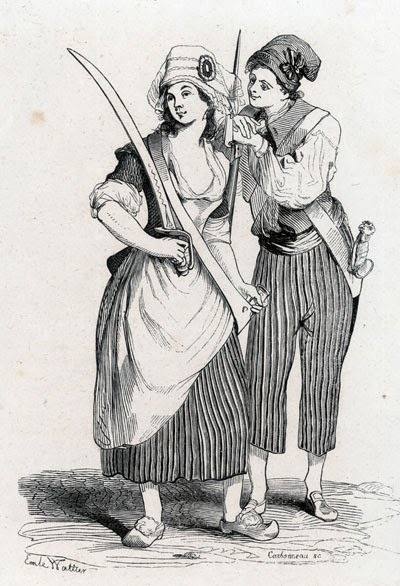 “The visible signs of patriotism.” said Helen Williams, “were dirty linen, pantaloons, uncombed hair, red caps or black wigs.” Radical deputies to the Convention wore rough pantaloons and short coarse jackets; the Girondins favoured floppy muslin cravats. Only Robespierre, who was said to resemble “a tailor of the ancien regime”, continued to appear “poudré, frisé, parfumé and a hundred times more muscadin [foppish] than any of us”.